On 22nd of Ramadan, Shaykh-ul-Islam Dr Muhammad Tahir-ul-Qadri spoke to thousands of participants of the Itikaf City after Fajr prayer. The speech was telecast live from London, UK, through video conferencing and shown around the world via Minhaj TV. Shaykh-ul-Islam continued his talk on the subject of intention. Dr Muhammad Tahir-ul-Qadri said that the process of man’s reform begins with intention. He said that the speed with which chaos, infidelity, and sin were increasing obliged one to work with the same speed to fight against these evils in a passionate and concerted manner. He underlined the need of making effort in this respect, adding that faith could not be saved from evil’s offensive with merely love and devotion. Shaykh-ul-Islam said that there was no shortage of his followers and devotees around the world but he did not want them to get stuck up in devotion. He said that irrespective of the fact whether one has devotion towards Hazoor Ghous-ul-Azam, Data sahib, Baba Farid Gunj Shakr or any other saint, mere devotion could not be helpful in protecting your creed and belief system from external attacks. He said that in order to be able to protect one’s faith, one should follow one’s spiritual mentor in entirety both in words and actions. He bemoaned the fact that there was no shortage of spiritual mentors within the Sunni school of thought who had defrauded their followers in the name of devotion. 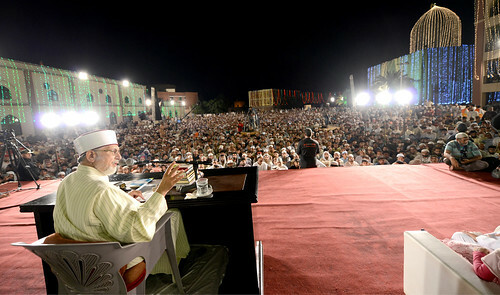 Dr Muhammad Tahir-ul-Qadri said that none of the exalted people from Companions of the Holy Prophet (SAW) to saints, who played pivotal role in changing people’s destiny by enlightening them and brought about reforms at a wide scale in their respective societies, ever taught their followers to solely depend upon them for their salvation. He categorically stated that this mischief had reared its head within the Sunni school of thought whereby it was being propagated that those who joined the bandwagon of their so-called mentors by demonstrating extreme amount of devotion, would be successful not only in this world but also in the next one, for these followers pander to whims of their masters and grease their palms. He said that these things are in gross violation of actual teachings of the saints. He said that youths were being led astray and estranged from religion through such mischief. These people, he said, needed to be held accountable for their wrong interpretations. Shaykh-ul-Islam warned people of consequences of doings of such people. He termed it as conspiracy against spiritualism. He said that 12 centuries ago, when the saints would invite people to join their company. The people would ask them whether they would tell them about the living or the dead. Upon being told that they would get to hear about the living, the people would refuse to listen to them and ask the saints to tell them about the dead. Dr Muhammad Tahir-ul-Qadri said that if anyone was interested in learning about spiritualism and mysticism and fathoming its reality, then one should learn it from life history of those who had passed away many ages ago. He said that this was the crux of the Saints’ and Companions’ teachings. He added that spiritualism propagated and adhered to by the likes of Khawaja Moin-ud-Deen Chishti, Qutub-ud-Din Bakhtiar Kaki, Baba Farid Gunj Shakr, Hazrat Bahauddin Zakria, Hazrat Mujdad Alf Sani, Hazrat Sultan Bahu, Shah Salman Tansvi, and Hazrat Maher Ali Shah revolved around sincerity of intention as well as the life and works of those who had left this world. He said that those who preached spiritualism without reference to the Holy Quran and Sunna are neither spiritual mentors nor true guides but plain fraud. He asked those who want to learn about spiritualism to read about renowned spiritualist of his age Basher-ul-Hafi to whom even animals showed deference. He said that conversely speaking, the so-called spiritual guides of today remain in search of their potential disciples. He said that real spiritual mentor is the one who is sought after by the followers not vice versa. He said that farce was also being shown on media in the name of spiritualism. He said that the practices being projected on national TV channels did not have anything to do with spiritualism. The lecture was followed by Dua.